A wise man (Okay, Max Bialystock from The Producers) once said, “When you’ve got it, flaunt it!” This is wisdom Legend of Korra knows well; with the show’s original animation team, the meticulous artisans of Studio Mir, back in tow, and an episode set in a surreal universe where anything goes, “it” was flaunted and then some. Last week, Korra and her surrogate sister Jinora fell down a dragonfly bunny hole to the spirit world. In “A New Spiritual Age,” connections to Lewis Carroll’s Alice in Wonderland grew beyond resemblance to full-blown allusion as the duo took their first steps into the parallel universe. Korra arrives with a Queen of Hearts in her crosshairs, the religious zealot Unalaq who is bent on spreading darkness across the land. But in Carrollian tradition, she first had to run into the inhabitants of Wonderland. Writer Tim Hedrick truncates Carroll’s story in faithful fashion. 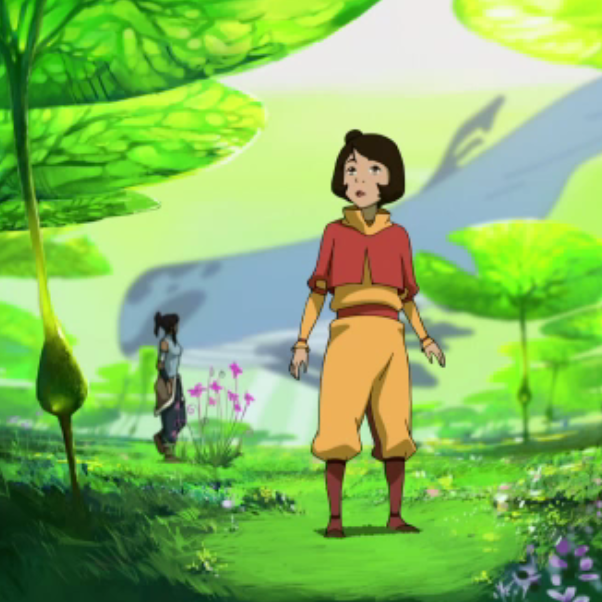 After encountering a pack of belligerent, talking prairie dogs who take kindly to strangers, Korra is drowned in her very own “Pool of Tears.” The funnel spits her out in a the middle of a gnarled forest — similar to the one seen in “Beginnings” and even more similar to the purple-hued Tulgey Wood of Disney’s 1957 Alice in Wonderland. It’s bustling with creatures — a ferocious caterpillar beast, a blink-and-you’ll-miss-it Cheshire Cactus, and even a Legend of Korra version of the Jabberwocky. The riff is a visual feast that’s justified when Korra, magically reduced to child, meets the spirit world’s Mad Hatter stand-in. Legend of Korra has been careful not to depend on Avatar: The Last Airbender for quick, fan service-induced shocks. When they play a callback card, it always makes sense to the emotional arc of the narrative. Introducing Uncle Iroh back into the fold hits fans like a ton of bricks while still feeling earned. Who better to instruct young Korra than the wisest man ever to have existed? There’s a touch of sadness seeing the spirit of Iroh revived on the other side — Greg Baldwin replaced the legendary Mako, original voice of the character, when the actor passed away before Avatar Book Three — yet any sorrow is dispelled upon the sage’s first words of advice. With all the respect in the world, Iroh extends his hand to 6-year-old Korra and leads her to his tea party (of course!) where she discovers a human side to the bizarre wonderland. Like Alice, Korra’s journey is full of self-discovery, confronting the life lessons we learned as kids that are easily taken for granted when we become “mature” teenagers. Guided by Iroh, young Korra learns that Dr. Norman Vincent Peale is right: There’s power to positive thinking. Literally, when she’s mad, the world goes dark. When she’s confident, cheerful, open-minded, and in tune with nature, light can dissipate all evil. She soaks up the zen guidance while besting an elderly Beet Person to a game of Go, what might be the most “Iroh” schooling method imaginable. “If you look for the light, you can often find it. If you look for the dark, it is all you will ever see,” Iroh tells Korra before the rugrat ventures off to save a dying dragonbird. It’s a touching moment, restoring the love drained out of the show after the Team Avatar split up. As Korra deals with being pint-sized, Jinora catches a lift from her dragonfly bunny friend FurryFoot, zipping to another familiar location. Jinora stumbles in to the vast collection, previously seen sinking into the sand in the Avatar: The Last Airbender episode “The Library,” of Wan Shi Tong, the Knowledge Spirit. There’s a wonderful moment before the towering owl lands in front of her where Jinora is awestruck by the reading material in the library. “I could just stay in here forever, reading,” she says, channeling every bookish youngster who took solace in the pages of fantasy (I can’t be alone here). Jinora wins over Wan Shi Tong with sly fact-checking (thanks to Korra, children who grew up without radios now understand how they work) and before long, she’s knee-deep in Harmonic Convergence for Dummies. When Legend of Korra first premiered, it felt like a godsend — an animated TV show with a strong female protagonist! And now we have a second in Jinora, an endorsement for brains over brawn. Just when life starts looking bright, Wan Shi Tong reveals himself to be in cahoots with Unalaq. Jinora becomes the perfect bait for Korra and we’re served up the first face-off between the fully unveiled Unalaq and the bending-less Avatar (since she meditated her way into the spirit world, she wasn’t allowed to bring her powers in carry on luggage). Director Ian Graham and the Studio Mir animators go wild in the events leading up to battle. The camera zooms in and out, turning the scenery into theatrical sets that come and go as perspective changes. It’s all very Terry Gilliam-esque — appropriate, as the Monty Python trouper directed Jabberwocky back in 1977 — and it adds moment to the characters’ detailed poses and facial features, a signature of Studio Mir. Korra opens the portal to save Jinora because her heart is too big. She can’t help it! And it blows up in her face. Unalaq runs off with the tween, Korra snaps back into reality, and the stage is set for Vaatu’s escape from incarceration. Without much screen time, Tenzin is the real backbone of “A New Spiritual Age.” He’s heartbreaking in the episode’s intro, sitting face-in-palms, crippled by his inability to crossover to the spirit world. And then there’s Korra’s return to the Southern Air Temple without Jinora. The look on Tenzin’s face when he realizes that his daughter isn’t returning, full of despair and fright and confusion … someone drew that. A melancholy ending that comes with a silver lining: Korra returns from Wonderland with maturity. She hasn’t just heard what’s wrong with being steadfast, stubborn, and susceptible to frustration, she’s learned it firsthand. The plan: smash through the looking-glasses, er, portals, and restore balance to the two planes of existence. A little brute force will be involved. Consistent with “Beginnings 1& 2,” the spirit world is one gigantic love letter to Hayao Miyazaki and the films of Studio Ghibli. Globules are a stylistic trademark of the animation master and the talking prairie dogs exploding in a bombardment of purple muck on top of Korra feels like a tip of the hat to that. The giant fish that eats Korra: a reference to Alice, the Biblical story of Jonah, or Star Wars: Episode I – The Phantom Menace? You decide. The spider made of hands that briefly appears in the dark forest will haunt my nightmares for the next week. The baby dragonbird looks suspiciously like a chocobo from Final Fantasy. The grown-up dragonbird looks suspiciously like a mixture between the legendary Pokémon Zapdos and Moltres. These two statements may have crossed a geek line. Young Korra is the most adorable character since Blueberry Spicehead. “I can make the sun shine.” Awwwwwwww. Professor Zei’s corpse … was a grim callback. “Don’t believe everything you read,” Unalaq says to Jinora, as she explains to Wan Shi Tong that the guy is out to destroy the world. Unalaq would do well in American government. One more Miyazaki reference that nearly matches the original: As Korra’s Dragon Bird swoops down to save the day, it’s hard not to picture a scene from Spirited Away, where the dragon river spirit Haku takes Sen on his back and whisks her into the air. Both beautifully realized moments surrounded by epic scores.